The following article is based upon one published in Guns Review magazine in 1980; in the days when owning and shooting pistols was still legal in the UK. With thanks to B P Andersson for information concerning the demise of the m/40 in Swedish service. The Lahti pistol, and the derivative Husqvarna, are among the most interesting and individual self-loading pistols ever to see military service. The gun was produced in time to see action in the Russo-Finnish War of 1939-40 and apart from a small order in 1958 all production had ceased by 1950, yet in the 1980s it was still in service in both the Finnish and Swedish armies. 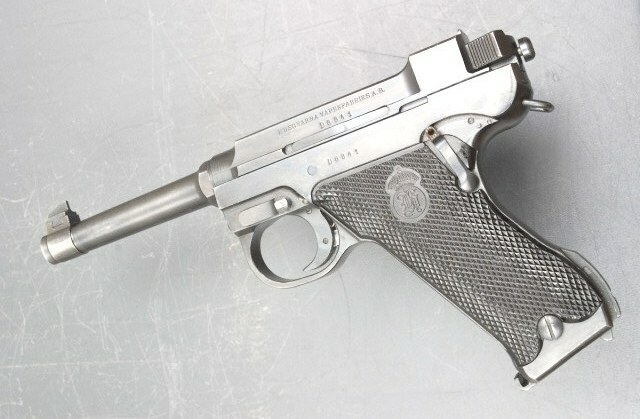 The pistol was first conceived in 1929 by the prolific Finnish arms designer Aimo Lahti in response to a requirement for a weapon which would function reliably in the bitter Scandinavian winters, and was accepted by the Finnish armed forces in 1935 as the L35. A few years later the Swedish army was also in the market for a new pistol. At first the Walther P38 was selected, but the advent of the Second World War raised supply problems. Eventually the efficient performance of the L35 in the Winter War persuaded the Swedes to adopt this pistol with the designation m/40, although it did not enter service until 1942. The Finnish model was made by Valtion Kivaaritehdas (State Weapons Factory) at Jyvaskyla, and the Swedish version by Husqvarna Vapenfabriks AB, but both are generally known as Lahtis. There are several minor differences between the Finnish and Swedish variants, and the situation is complicated by the fact that the L35 was itself modified more than once during its somewhat intermittent production life. Initial manufacture by the Finns was slow since the pistols were virtually hand-built, and was interrupted by the fighting with Russia in both 1939-40 and 1944-46. By 1950 when production ceased about 12,000 had been made. 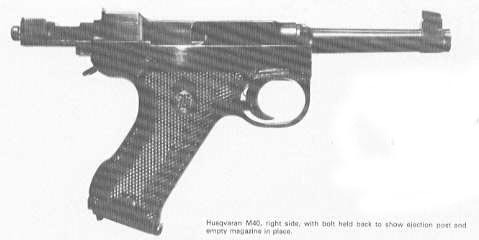 The Finnish army ordered another 1,250 in 1958, but these were hybrid pistols built with some help from Husqvarna; presumably some of the original tooling had worn out or been disposed of. Swedish production, once started, was more straightforward. Husqvarna was the sole manufacturer and between 1942 and 1946 produced over 80,000 m/40s and nearly 1,000 civilian models. Apart from initial Finnish prototypes in 7.65 mm Parabellum, both pistols were made solely in 9 x 19 mm Parabellum. Both models have been quite uncommon in the UK. As one might expect, the majority of examples which do occur are Husqvarnas (and are so marked on their black plastic grips) but are likely to be ex-Swedish police rather than military equipment since the police adopted lighter weapons some years ago. However, there is no difference between the police and army versions except that military issue has the Swedish triple crown marked on the holster. The Finnish pistol (marked VKT on the grips) has a very high reputation because of the hand-building and the use of special steels, and must be considered a valuable collectors' item. At first sight the Lahti is reminiscent of the Luger, with its well-raked grips and slender barrel. This is no accident, since the 7.65 mm. 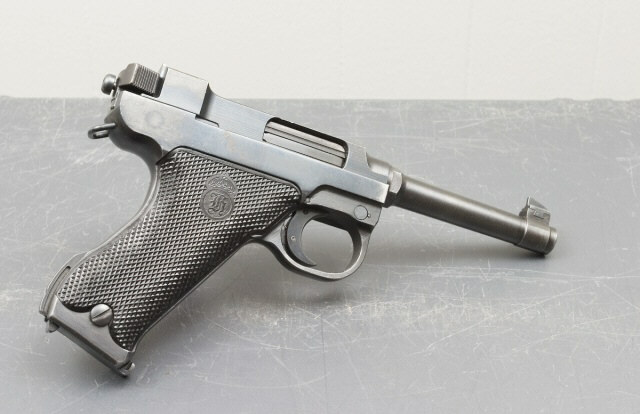 Luger was the L35's predecessor in Finnish service. The Lahti, however, is a bigger and heavier gun with a more angular appearance. The m/40 has a 140 mm barrel and weighs about 1,100 grams empty. The L35 has a shorter (105 mm) barrel but is slightly heavier. The Lahti also has a completely different action in the interests of reliability in extreme conditions; a virtue not normally attributed to the Luger. The barrel is rigidly attached to a box-shaped extension which almost entirely encloses the action. Within this extension is a square-section bolt which is exposed only at the ejection port and at the rear of the action, where two grooved "wings" facilitate cocking. On top of the bolt is a separate locking yoke in the form of an inverted "U" which fits into grooves inside the barrel extension and into a large notch in the top of the bolt. On firing, an internal hammer swings up to strike a long firing pin within the bolt. The whole assembly recoils some 6 mm, then the locking yoke is cammed upwards to unlock the bolt, which continues rearwards to complete the normal self-loading cycle. This action is similar to the Bergmann-Bayard and is very strong indeed. An additional refinement is a rocking accelerator which gives the bolt an added rearward kick on unlocking, therefore ensuring proper cycling of the action when ammunition pressure has been reduced by extremely low temperatures. The gun has a very clean, uncluttered external appearance, with just two catches on the left hand side; the safety and take-down levers. The safety catch is in a better position than in the Luger, since it is possible to operate it single-handed. It does not, however, fall naturally to the thumb and is rather small and stiff besides, so I found it more convenient to operate with the left thumb when using a two-handed grip. In action, it forces the sear into locked engagement with the hammer notch for a positive mechanical block. The m/40 does not have the L35's loaded chamber indicator; the only functional difference between them. The eight round box magazine is held in place by a catch at the bottom rear of the grip, tensioned by the mainspring. There is no magazine disconnector, so in an emergency the gun could be fired while changing magazines. The sights are astonishingly good for a military pistol, being very large and clear. A U-notch is fixed at the rear, but the tall post foresight is dovetailed in place and can be adjusted for windage with the aid of a suitable blunt instrument. The zero mark is engraved at the front of the foresight, which is just as well since on my example (an m/40) the sight tended to drift slightly with use until persuaded otherwise by a centre-punch. The back of the grip has been designed to accept a shoulder stock, a curious relic of the 1930s, but I gather that in practice this facility was never used. Stripping the gun is quick and simple up to a point. The action is cocked and the bolt held back. This has to be done with an empty magazine in place since there is no external bolt catch, but once achieved the magazine can be removed. The take-down lever is then turned through 90º, the bolt tugged rearwards to free it and the barrel extension/locking yoke/bolt assembly slid forwards off the receiver, exposing the long central recoil spring. The bolt then slides out of the barrel extension, leaving the yoke free to drop out. This is adequate for routine cleaning, but more fundamental work requires the attentions of an armourer. Once stripped, the pistol reveals a reassuringly sturdy, machined-from-solid construction that is in marked contrast to the modern "pressings and plastic" approach. Unkind observers have been known to describe it as "agricultural"! The m/40 comes as part of an "all-in package" including two magazines and loading and cleaning tools (which also incorporate screwdrivers} all fitting into a black leather holster. The provision of a magazine loading tool may seem to be an intriguing military gimmick - until loading is attempted without it. Lahti was obviously well aware that a highly angled grip causes more feeding problems than a vertical one and in his anxiety to ensure reliability specified a magazine spring of impressive authority. The first rounds go in fairly easily, but it is difficult - and painful - to fill the magazine without the loader. Once the magazine is inserted it is advisable to cycle the action with some brutality to ensure proper feeding of the first round. A more tentative approach encourages the bolt to stick halfway through its forward travel due to friction as the action is cammed into lock. The m/40 is an exceptionally comfortable gun to shoot. The considerable weight, long barrel and natural grip angle all help in reducing apparent recoil to a minimum. Furthermore, the large clear sights and relatively rigid barrel would make this a highly accurate pistol were it not for the rough trigger pull. It is not particularly heavy (for a military piece) but is very long and "graunchy" due to an excessively generous sear engagement. Unfortunately this is not easy to remedy and is certainly no job for an amateur. The trigger itself is smooth and very wide, and is quite a stretch for small fingers to reach; much more like a target than a service trigger. Incidentally, the sights as issued were perfectly zeroed for 25 metres. I did try very deliberate shooting at 200 yards, with the gun supported. A man-sized target was hit with about 50% of the shots. Reliability was Lahti's chief priority, so I was particularly interested to observe the performance of his pistol in this respect. Functioning was virtually perfect with both low velocity (300 m/sec) Lapua and the noticeably much hotter 123 grain Federal ammunition. Reloads using 115 grain Lapua jacketed bullets and between 3.5 and 3.9 grains of Nobel No. 3 also cycled perfectly, and all of the jacketed loads not only produced similar group sizes but also shot to approximately the same point of aim. Astonishingly, my pistol took a marked dislike to the SFM ammunition supplied by the Army at a Service Pistol shoot at Sandhurst, failing to feed properly about 10 per cent of the time - almost as bad as the Army's own Brownings! The main difference was that such jams in the Lahti could be cleared instantly with a flick of the bolt; the Browning often requires a more laborious procedure. The only other flaw was the frequent failure to hold back the bolt after the last shot, especially with hot loads. It was a different story with lead bullets however. Using 125 grain Speer swaged bullets and between 3.5 and 3.9 grains of Nobel No. 3 as before, functioning was perfect but accuracy non-existent with only the odd bullet actually hitting the target and then leaving a hole of a most curious shape. An oversized bore was the first guess but examination of the fired cases showed several blown primers and some cases bulged beyond recovery. As might be expected, measurement showed the bore to be undersized at .3545", so clearly the bullets were being stripped by the deeply-cut rifling. A further test using 125 grain cast bullets and 3.6 grains of Red Dot showed reasonable accuracy but unwelcome consistency; this load jammed on every single shot! In conclusion, the low recoil, comfortable grip angle and clear sights mean that really rapid, accurate fire is possible (the rough trigger being hardly noticeable under these conditions) and in my hands it was a superior arm to the official Browning in Service Pistol competitions. The downsides are the rather awkward safety catch, low magazine capacity and slow reloading. In the mid to late 1980s, the m/40s were recalled from service due to several accidents in which parts of the slide/bolt assembly hit the shooter in the face. The reason was concluded to be metal fatigue, probably caused by the high gas pressure from the Swedish m/39B cartridge. For this reason, the m/40 was temporarily replaced with the old 07 Browning until the Glock 17 was purchased under the designation m/88 (the airforce selected the smaller Glock 19 as the m/88B) as it was concluded that the Glock could safely handle the potent m/39B round without excessive wear.